Big changes are brewing in the beer business. Pour yourself a cold one, we'll fill you in on the details. First of all, it's not just about guzzling any old beer any more. More and more beer drinkers in the U.S. are quaffing expensive, flavorful craft beers sold in local markets. But if craft beer is small and hyper local, big beer is huge and hyper global. The largest beer companies have aggressively courted new markets in far-flung countries. Asia, led by China, is drinking more lagers and ales. And companies with global ambition need size and heft. So, they've been buying each other to the point where almost all the best-known beer brands are owned by just about four companies. 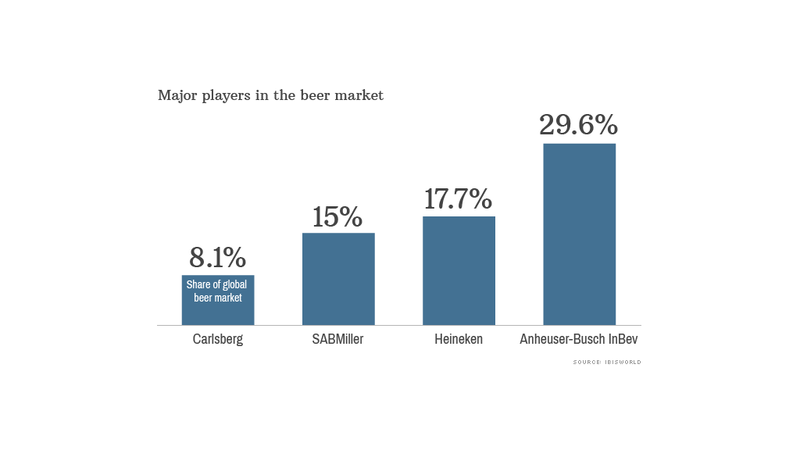 Anheuser-Busch InBev, Heineken, SABMiller and Carlsberg together control 70% of the nearly $150 billion global beer market. Formed of the union of beer brewers around the world, they have led to such a varied portfolio of global beers, it can almost make your head spin. Anheuser-Busch InBev (BUD), the largest of the lot, was formed of the union of Belgian beverage giant InBev and American powerhouse Anheuser-Busch. 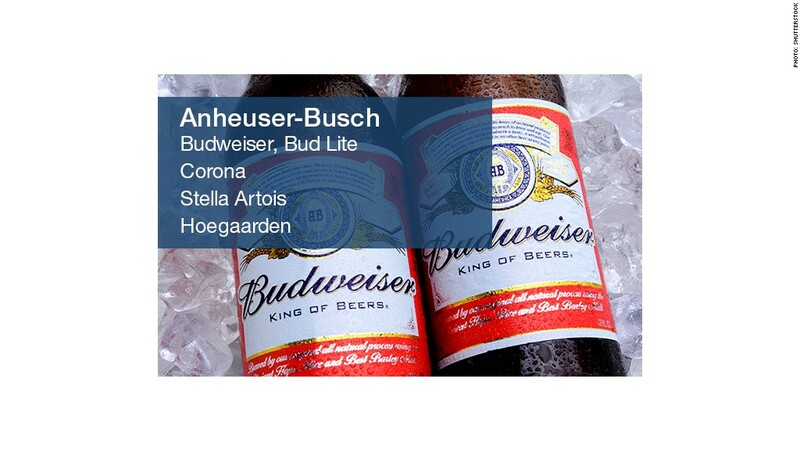 In its portfolio: Budweiser and Bud Lite, the best-sellers in the United States. It also owns the America's most popular imported beer: Corona and many others. Apparently, that's not quite enough. There are reports that AB InBev wants to get even bigger and is raising funds to buy SABMiller (SBMRF), the world's third-largest brewer. 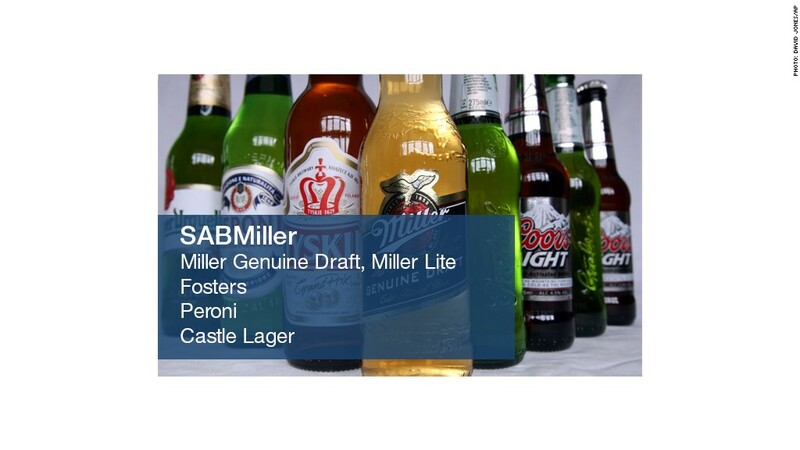 SABMiller is best known in the U.S. for Miller Genuine Draft and Miller Lite. SABMiller was formed in 2002 when South African Brewers (or SAB) bought Miller Brewing Company. The London-based beer giant also bought Australia's Fosters a few years ago. Not wanting to be perceived like it was being left behind, SABMiller recently made an offer to buy Heineken, the world's second largest beer maker. Heineken, best known for its namesake brand, rejected the offer. The Dutch brewer owns hundreds of premium, regional and specialty beers in Europe. And like the other beer giants, Heineken too has been expanding in Asia. 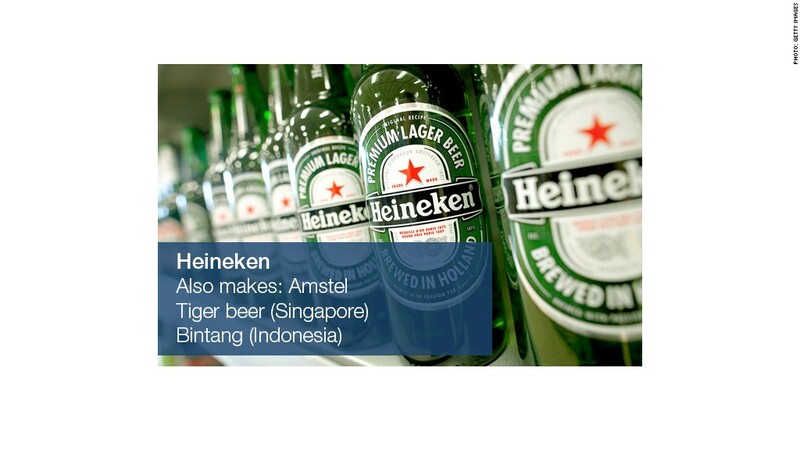 In 2012, Heineken bought Asia Pacific Breweries, maker of Tiger beer and Indonesia's Bintang, for $4.6 billion. It has also been buying breweries across Africa and South America. But the most popular beer in the world is one that many in the western hemisphere have probably never even heard of. 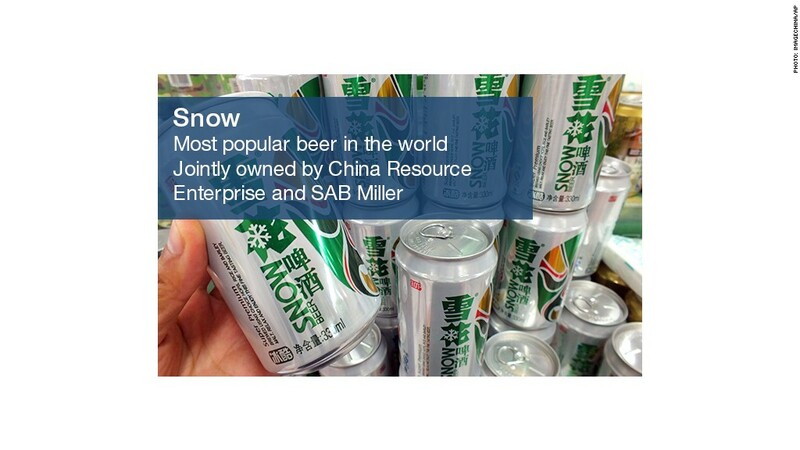 Snow is the most consumed beer in the world and is sold in China. The lager is made by China Resources Enterprise and SABMiller. The Chinese knocked back 10.3 billion liters of Snow last year. 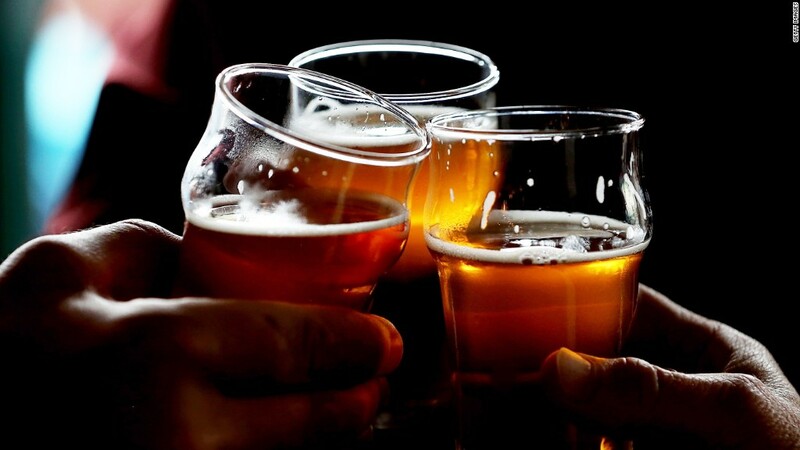 China surpassed the United States in 2010 to become the biggest beer market in the world, in terms of total volume, according to market researcher IBISWorld. SABMiller also owns a majority stake in a joint venture with Molson Coors (TAP), which is itself a collaboration between Canadian and American companies. 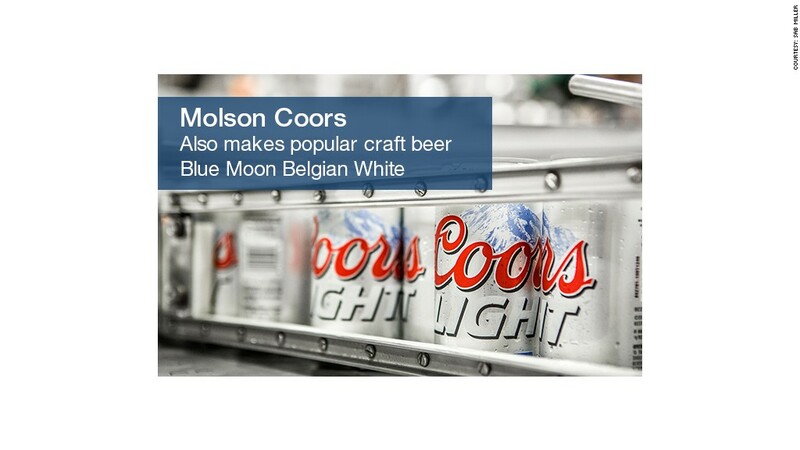 That joint venture, called MillerCoors, sells well-known beers Coors Lite, Keystone and Blue Moon, among others. As the big beer companies are busy getting bigger, it's the little guys that are getting all the attention in the neighborhood pubs. Craft beer makers, often referred to as microbreweries, make small quantities of beer in multiple flavors and colors and typically only sell in their local market. Sales of craft beer rose more than 17% last year, even as overall beer sales declined, according to the Brewers Association, which represents small brewers. 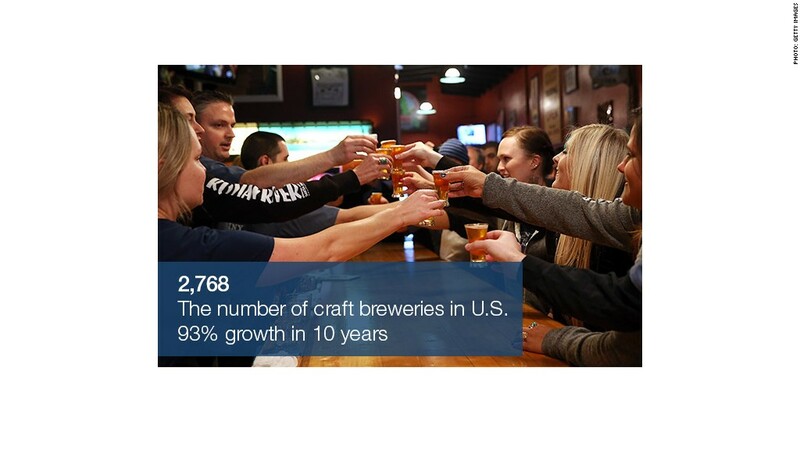 Samuel Adams, brewed by Boston Beer (SAM), is the top-selling craft beer brand in America. But most craft beers are by definition small, and produced and sold locally.